There is an issue I must address as it has come up a great deal. The issue is as old as time itself; jealousy and insecurity, in martial arts this expresses itself in terms of ranks and status. Ranks, belts, titles, in Krav Maga, Karate, any art; I have been dealing with this issue for as long as I can remember, first as a student and later as a teacher. As a student we often feel that somehow our teacher has misjudged us, overlooked us or simply suffers from lack of attention or poor eyesight or forgetfulness. How could that guy possibly have "earned" his brown belt before me! Did he buy it!? The very question shows a lack of self-respect, a lack of confidence, and a lack of respect for your teacher. If you feel you have been overlooked it is acceptable to respectfully ask; What are you looking for in order for me to earn my next rank? To question the rank your teacher awarded to another student is never acceptable. I have never asked for any rank and I never questioned my teacher about the ranks he awarded to my fellow students, but at times I did feel there was injustice. Thankfully I kept my mouth shut. Time took care of everything, but it took a long time. There was one student who participated in an "international" competition in Greece. She came back with a huge trophy, second place finish. Upon her return she was declared a national hero and awarded a third dan (with no test). She was invited as a guest of honor to martial arts events which advertised "in the presence of the runner up to the world champion." Soon the words "runner up" were dropped and it became simply, in the presence of the world champion. During this period I had been teaching about ten hours daily. Among my students were the needy who could not pay and several handicapped students. I became known locally as the "teacher who teaches martial arts in a healing way". Parents came to me with their children who needed social skills, interpersonal skills, ADD, and every disorder you can imagine. But in terms of rank and recognition, I was totally overlooked. One line I kept hearing from my teacher was "Your day of glory will come" and it has, many times over. In 2010 I was awarded European martial arts instructor of the year, in 2014 "International Krav Maga instructor of the year." Truthfully by the time these awards came it no longer mattered, I no longer needed any formal recognition for I learned that the true recognition is never expressed with a piece of paper or a plaque. The true recognition is written on the faces of your students, and that is all a true teacher needs. But the recognition did come, and the long term is all that matters. The third dan black belt came, and the fourth, and the fifth and sixth. Patience. Hard work pays off. My friend who took second place later confided in me; there were only two women in her weight category, and she took second place after losing her only fight. I asked if she at least fared respectably, she said, "No, I was thrown around like a rag doll, she wiped the floor with me." But yet the title of Second Place was enough for our organization (which of course I am no longer associated with) to drool over her "achievements" and milk it for all it was worth. I, on the other hand, was overlooked. I learned to deal with it and never expressed a word of anger or disappointment. This was a lesson I would use as a teacher. Going back a little further, first black belt test. I worked hard, very hard. My teacher used to say, "As sure as I am that the sun will shine tomorrow I am sure that Moshe will be on the mat"
I trained hard, I made it my number one priority, ahead of work, ahead of ...everything. I gave it my all. There were others who had a more relaxed attitude, they showed up when it suited their schedule. One of them was Mikey. And yet Mikey earned his black belt the same day I did. I never said a word but yet I felt what is my belt worth if this guy who shows up now and then received his black belt the very same day that I did? The feeling stayed with me, and it was not a good feeling. I continued to "lengthen my line" rather than cut down the line of others. I did my work. Soon I was being invited all over the world to teach Krav Maga. After a very successful five day seminar in Holland I had an eye opening experience, at the airport. As I was waiting with my fellow Israeli travels for the El Al security, I heard someone call my name. It was my old training partner Mikey. Funny bumping into him here, in Holland. What brings you here?, I asked. He was here to run a marathon and was with a group of other Israelis. Had he learned any Dutch? Not a word, yet I was already conversant in this interesting language. He asked what I was doing there and I told him of my Krav Maga seminar. I asked if he was still active in Krav Maga. He was not. He believed his black belt and diploma where in some box. He had moved a few years ago and could not recall where he put it. This is how you treat a black belt!, I wondered. Is that all it means to him now? So it is the long term that counts and the lesson was powerful; those who work hard may not be recognized immediately but they will be recognized in the long run. The cream rises to the top but it may take time. I worked harder then but I was not recognized. I felt a little frustrated but that was foolish pride. The long run is the proof. If you work hard it will pay off in the long run. As my teacher said...your day of glory will come. We should not seek glory but we do appreciate recognition. That is why we need the belt system, human beings crave recognition. It takes a long time to overcome this and only few of us ever truly achieve it. I have yet to meet a student who did not appreciate a compliment on his achievements. I have not yet met a person who did not appreciate hearing, "You are looking good, I can see that you have lost weight." But we must be patient. That day in Amsterdam I learned a valuable lesson; those who deserve recognition will get it, forget the short term, if you work hard you will get it in the long term. The long term is what matters. And God works in funny ways. While checking in I was told that I was upgraded to business class. Whoopee!! Yey! I had been dreaming of this day. I boarded the plane first and took my comfortable seat. Sometime later I saw Mikey and his friends boarding, as they were walking through Business Class to get to the cheap seats (where I normally sit myself) we made eye contact. For a moment I wondered what he was thinking now, but I did not need to wait long. He looked at me and he said, "Good things come to good people, Moshe you earned this". I was just awarded my just rank. 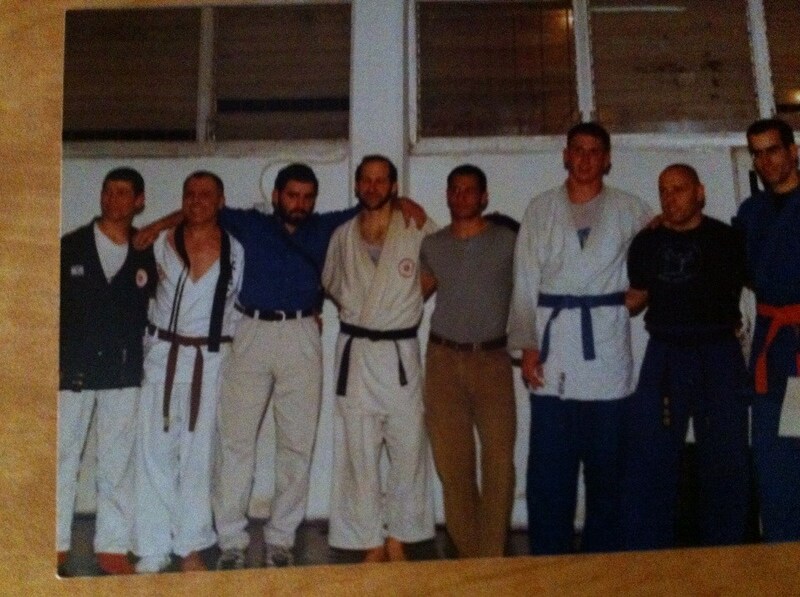 That day I had really earned my first dan black belt again, but in the way that I wanted it all those years ago. But I also felt deeply ashamed. I felt ashamed for my petty jealousy. I felt ashamed that my joy for earning my black belt 15 years earlier was marred by the fact that someone else earned it on the same day, and I did not feel they worked as hard as I had. In the long run we get what we deserve and we should never, ever, diminish what we have because someone else has more, or the same. But I also remembered something my teacher had said. He was discussing some other students. This one earned his brown belt but he did not really look that impressive. In fact he only did one knife defense, but, my teacher pointed out, he was in fact quite dyslexic. Learning that one technique was a huge accomplishment and it was more difficult for him to learn one than for me to learn five. Things like this matter in terms of rank. I never forgot that. Another student did not look so good in the fights, but, turns out he suffered from a bad case of asthma. Another student did not come to class that often, yet he earned a high rank of black belt. My teacher pointed out that he was supporting three generations; himself, his mother and his grandmother. He did not have the luxury of free time that I had. All these were factors. I learned this lesson well. We never know the full story. And now I ask my students; do not question the ranks I award to others, do not ask me to justify my promotions. Focus on your own personal development. Increase the length of your line rather than cut down the line of others. And...in the long run your efforts will be rewarded and recognized. If someone earned his rank on the same day as you, and in your "expert opinion" he did not deserve it, keep those thoughts to yourself. Better yet, just drop it. Enjoy your promotion without comparing it to that of others. Do not diminish your happiness because you feel someone unworthy was promoted. You will only hurt yourself, and remember, your day of glory will come, if you deserve it. If we focus on our own development rather than on the ranks of others we will progress much faster. Proven. Never question your instructor’s reason for promoting someone.